Naming a newborn in the USA sounds like possibly the last thing anyone should worry about if you’re thinking about rules that might come into play in the naming process and such. At the end of the day, it’s the parents who have free reign over naming their child whatever they deem most fitting for them (within reason, still). However, no matter how small or big of a deal it all seems like when put next to other laws and regulations, naming your child has to apparently adhere to various rules too, depending on where in the USA you live. Sometimes the laws make sense, other times they don’t, but at the end of the day, it’s still good to be aware of what can pose as a hurdle in your creative thinking process. Sometimes it’s just a matter of technical difficulties, other times we really are thankful that there are laws against possibly naming your child something the little one would regret while growing up. So if, for some reason, you’re trying to set aside the names that are not a possibility, just try to keep an eye on any regular keyboard and keep the name within the letters found there (since some states have issue with special characters, as it turns out), as well as stray as further away as possible from anything that could be trademarked or just simply inappropriate. The latter should go without saying though. These are the quirkiest or most significant baby naming laws in the USA, in alphabetical order by state! Starting off with Alabama, it seems like you can literally name your baby whatever you already settled upon, regardless if you’re thinking about the first or last name, so long as you don’t use numbers or symbols in their name. Their rule is pretty much “no rules”, which also means your baby’s surname doesn’t even have to be yours or your spouse’s – anything goes. Alaska offers assured freedom of naming your baby pretty much anything with special characters in it, like tildes and umlauts to name a couple, since their state computer isn’t as picky. Foreign names are easily given because of that. Arizona’s state computer and birth certificate system, however, seems to be oddly specific about its character limit and the way those characters are distributed all over. It’s not that they’re too limiting, it’s just that it’s weirdly exact. With a limit of maximum 141 characters, distributed as 45 characters for the baby’s first name, another 45 for the middle name and 45 more for the last name, with a spare total of 6 characters left available in case you want a suffix, Arizona manages to have the quirkiest law in the list [i]so far[/i]. At least they allow apostrophes and periods, hyphens and spaces, right? As the next one up on the list, Arkansas makes us wonder just how many people tried to name their newborns “Baby”, “Infant”, “Test” and “Void” and any other alterations of those upon registering since they specifically have a rule against using those “names”. Void’s pretty cool, though. Arkansas allows spaces and hyphens and apostrophes in a name though, which is good, unless you’re trying to use them consecutively, which is a no from Arkansas apparently. Colorado sticks to the no-foreign-characters style, but at least they have no character limit on the baby’s name. In Connecticut, as long as the name you picked out for your baby is not used with the intent of committing fraud or anything else of illegal nature, according to their law, then you should be all set. Still, you can’t use foreign characters. Florida here has an interesting rule regarding the first name of the baby, saying that, in case the parents can’t decide on one for their baby right away, then they can just leave them unnamed until they come to a decision together and sign a document to prove you have agreed on it together. Otherwise, the court will just pick out a name in their place. Georgia adheres to the “no symbols” rule as well, sadly, but that’s about it in terms of naming rules. Hawaii’s naming system allows anything and everything to be used, including symbols and accents and everything you might need in your newborn’s name. Just so long as it’s not only symbols, and each one is actually accompanied by a letter, then you should be fine. Idaho only allows letters to be used, and any symbols and special characters are not allowed. Illinois holds no bans over anything you might want to name your newborn, and there’s already a child registered with the first name “7”, so they are pretty relaxed about quirky names. Indiana doesn’t have any rules regarding the first name of the newborn, however, it does hold one regarding their last name. If the mother is not married when the child is born, the newborn automatically inherits her surname and it’s the only last name they can take unless paternity can be proven through an affidavit. Trying to include symbols in a baby’s name or even the lack of the last name are both banned in Kansas, and as such newborns are required to have a surname, and names that only use letters. Louisiana also had a great law for naming newborns, strictly forbidding any obscenities for being used as names, and we’re thankful for it. Foreign characters aren’t allowed though, so any names with diacritics fall from the options list. The law about the newborn inheriting their unmarried mother’s surname also applies here, and if the mother is already married, they take the partner’s surname. It can be changed if the parents specifically ask otherwise, though. Foreign characters are, once again, excluded from the list of available letters when naming a newborn in Massachusetts. The same as above applies for naming babies in the state of Michigan as well. The newborn’s complete name, first, middle, last, needs to fit within a 150 character quota, with 50 characters allocated for each name. At the same time, Minnesota bans any numbers or symbols or foreign characters from being used when naming a baby. However, hyphens and apostrophes are the exceptions to the rule, being the only type of punctuation allowed in the naming process. In the state of Mississippi, a newborn’s last name automatically is crossed down as one of the husbands of the mother if she’s already married when the baby is born. If they want to change it, they have to request it afterward and be overseen by a hospital representative. Montana also has no special rules regarding baby naming, so long as you don’t use special symbols and foreign characters you should be fine. Nebraska also uses our favorite law, the one against obscenities in the newborn’s name. What’s more, they don’t allow abbreviations of anything offensive either, so, go Nebraska! The only thing significant about New Hampshire’s naming rules is that the whole name, first-middle-last, has to not exceed 100 characters. Here the state also bans obscenities, alongside symbols and numbers this time. In New Mexico, a very specific law deems names such as “Baby Boy” or even “Female” as not allowed to be used, and they also ban special characters. No numbers, no symbols, and no going over the 30 characters limit set for the first and middle name each in New York. However, the last name can have up to 40 characters. Anything goes in North Carolina, in terms of symbols and accents and other foreign letters that can be used. North Dakota isn’t picky at all about your newborn’s name, so long as their last name matches either one of the parents’ surnames and so long as you don’t use special characters. Ohio only allows English letters to be used, but also hyphens, spaces, and apostrophes. Oklahoma isn’t picky either, just as long as you only use English letters. Oregon’s naming system allows you to use up to 40 foreign letters, including umlauts, yes. 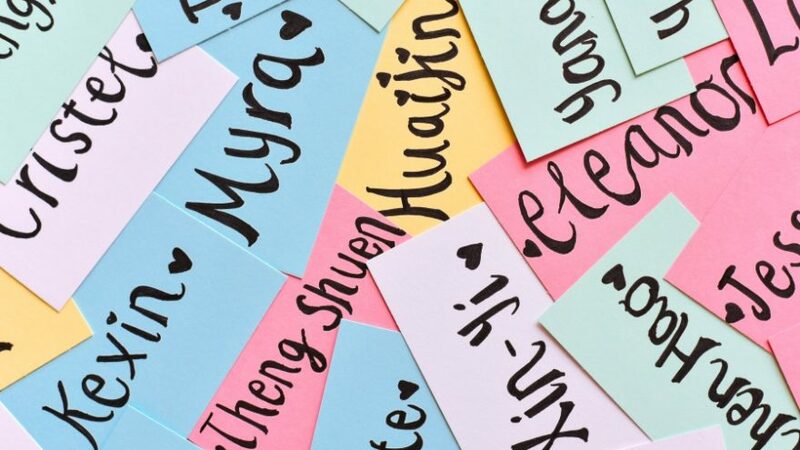 Rhode Island bans diacritics and other foreign characters from being used when naming a newborn, although you are allowed by the state to use them in other documents apparently. Both numbers and symbols are allowed, to accompany the letters you may want to use when naming your child in South Carolina. South Dakota has a ban on punctuation marks unless they’re the usual apostrophes, spaces, or/and hyphens. Tennessee state’s laws keep quiet about baby naming, so there aren’t many issues here, at least not with the baby’s first name. Texas forces you to stay within their 100 character limit when naming your newborn. Special or foreign characters are also forbidden. The state of Utah considers that using characters not found on a keyboard would make the process of applying and successfully getting a birth certificate more complicated, so make of that what you will. It’s not a no, technically? Washington is only picky about name length, with 30 characters maximum allocated for first names and 50 characters for the middle name and their surname name. West Virginia is fine with any name so long as it doesn’t include any foreign characters whatsoever. Wisconsin doesn’t allow numbers in the baby’s name, but nothing else stands out in terms of naming laws. No foreign characters are allowed in newborns’ names in Wyoming either, sadly.